For other uses, see Point reflection. In geometry, inversive geometry is the study of those properties of figures that are preserved by a generalization of a type of transformation of the Euclidean plane, called inversion. These transformations preserve angles and map generalized circles into generalized circles, where a generalized circle means either a circle or a line (loosely speaking, a circle with infinite radius). Many difficult problems in geometry become much more tractable when an inversion is applied. The concept of inversion can be generalized to higher-dimensional spaces. P' is the inverse of P with respect to the circle. This is called circle inversion or plane inversion. The inversion taking any point P (other than O) to its image P' also takes P' back to P, so the result of applying the same inversion twice is the identity transformation on all the points of the plane other than O. To make inversion an involution it is necessary to introduce a point at infinity, a single point placed on all the lines, and extend the inversion, by definition, to interchange the center O and this point at infinity. It follows from the definition that the inversion of any point inside the reference circle must lie outside it, and vice versa, with the center and the point at infinity changing positions, whilst any point on the circle is unaffected (is invariant under inversion). In summary, the nearer a point to the center, the further away its transformation, and vice versa.  To construct the inverse P' of a point P outside a circle Ø: Let r be the radius of Ø. Right triangles OPN and ONP' are similar. OP is to r as r is to OP'. Draw the segment from O (center of circle Ø) to P.
Let M be the midpoint of OP. Draw the circle c with center M going through P.
Let N and N' be the points where Ø and c intersect. P' is where OP and NN' intersect. Draw ray r from O (center of circle Ø) through P'. Draw line s through P' perpendicular to r.
Let N be one of the points where Ø and s intersect. Draw line t through N perpendicular to ON. P is where ray r and line t intersect. 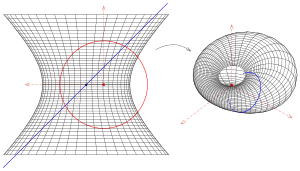 There is a construction of the inverse point to A with respect to a circle P that is independent of whether A is inside or outside P.
Consider a circle P with center O and a point A which may lie inside or outside the circle P.
Take the intersection point C of the ray OA with the circle P.
The inverse, with respect to the red circle, of a circle going through O (blue) is a line not going through O (green), and vice versa. The inverse, with respect to the red circle, of a circle not going through O (blue) is a circle not going through O (green), and vice versa. The inversion of a set of points in the plane with respect to a circle is the set of inverses of these points. The following properties make circle inversion useful. A circle that passes through the center O of the reference circle inverts to a line not passing through O, but parallel to the tangent to the original circle at O, and vice versa; whereas a line passing through O is inverted into itself (but not pointwise invariant). A circle not passing through O inverts to a circle not passing through O. If the circle meets the reference circle, these invariant points of intersection are also on the inverse circle. A circle (or line) is unchanged by inversion if and only if it is orthogonal to the reference circle at the points of intersection. 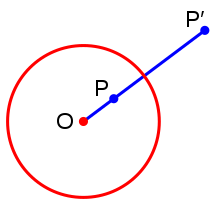 If a circle q passes through two distinct points A and A' which are inverses with respect to a circle k, then the circles k and q are orthogonal. If the circles k and q are orthogonal, then a straight line passing through the center O of k and intersecting q, does so at inverse points with respect to k.
The points of intersection of two circles p and q orthogonal to a circle k, are inverses with respect to k.
If M and M' are inverse points with respect to a circle k on two curves m and m', also inverses with respect to k, then the tangents to m and m' at the points M and M' are either perpendicular to the straight line MM' or form with this line an isosceles triangle with base MM'. Inversion leaves the measure of angles unaltered, but reverses the orientation of oriented angles. Invert with respect to the incircle of triangle ABC. The medial triangle of the intouch triangle is inverted into triangle ABC, meaning the circumcenter of the medial triangle, that is, the nine-point center of the intouch triangle, the incenter and circumcenter of triangle ABC are collinear. Any two non-intersecting circles may be inverted into concentric circles. Then the inversive distance (usually denoted δ) is defined as the natural logarithm of the ratio of the radii of the two concentric circles. In addition, any two non-intersecting circles may be inverted into congruent circles, using circle of inversion centered at a point on the circle of antisimilitude. The Peaucellier–Lipkin linkage is a mechanical implementation of inversion in a circle. It provides an exact solution to the important problem of converting between linear and circular motion. If point R is the inverse of point P then the lines perpendicular to the line PR through one of the points is the polar of the other point (the pole). If a point P lies on a line l, then the pole L of the line l lies on the polar p of point P.
If a point P moves along a line l, its polar p rotates about the pole L of the line l.
If two tangent lines can be drawn from a pole to the circle, then its polar passes through both tangent points. If a point lies on the circle, its polar is the tangent through this point. If a point P lies on its own polar line, then P is on the circle. Each line has exactly one pole. and the points P and P ' are on the same ray starting at O. As with the 2D version, a sphere inverts to a sphere, except that if a sphere passes through the center O of the reference sphere, then it inverts to a plane. Any plane not passing through O, inverts to a sphere touching at O. A circle, that is, the intersection of a sphere with a secant plane, inverts into a circle, except that if the circle passes through O it inverts into a line. This reduces to the 2D case when the secant plane passes through O, but is a true 3D phenomenon if the secant plane does not pass through O. The simplest surface (besides a plane) is the sphere. The first picture shows a non trivial inversion (the center of the sphere is not the center of inversion) of a sphere together with two orthogonal intersecting pencils of circles. The inversion of a cylinder, cone, or torus results in a Dupin cyclyde. A spheroid is a surface of revolution and contains a pencil of circles which is mapped onto a pencil of circles (see picture). The inverse image of a spheroid is a surface of degree 4. A hyperboloid of one sheet, which is a surface of revolution contains a pencil of circles which is mapped onto a pencil of circles. A hyperboloid of one sheet contains additional two pencils of lines, which are mapped onto pencils of circles. The picture shows one such line (blue) and its inversion.
) are mapped onto themselves. They are the projection lines of the stereographic projection. The 6-sphere coordinates are a coordinate system for three-dimensional space obtained by inverting the Cartesian coordinates. One of the first to consider foundations of inversive geometry was Mario Pieri in 1911 and 1912. Edward Kasner wrote his thesis on "Invariant theory of the inversion group". More recently the mathematical structure of inversive geometry has been interpreted as an incidence structure where the generalized circles are called "blocks": In incidence geometry, any affine plane together with a single point at infinity forms a Möbius plane, also known as an inversive plane. The point at infinity is added to all the lines. These Möbius planes can be described axiomatically and exist in both finite and infinite versions. A model for the Möbius plane that comes from the Euclidean plane is the Riemann sphere. The combination of two inversions in concentric circles results in a similarity, homothetic transformation, or dilation characterized by the ratio of the circle radii. Reciprocation is key in transformation theory as a generator of the Möbius group. The other generators are translation and rotation, both familiar through physical manipulations in the ambient 3-space. Introduction of reciprocation (dependent upon circle inversion) is what produces the peculiar nature of Möbius geometry, which is sometimes identified with inversive geometry (of the Euclidean plane). However, inversive geometry is the larger study since it includes the raw inversion in a circle (not yet made, with conjugation, into reciprocation). Inversive geometry also includes the conjugation mapping. Neither conjugation nor inversion-in-a-circle are in the Möbius group since they are non-conformal (see below). Möbius group elements are analytic functions of the whole plane and so are necessarily conformal. As mentioned above, zero, the origin, requires special consideration in the circle inversion mapping. The approach is to adjoin a point at infinity designated ∞ or 1/0 . In the complex number approach, where reciprocation is the apparent operation, this procedure leads to the complex projective line, often called the Riemann sphere. It was subspaces and subgroups of this space and group of mappings that were applied to produce early models of hyperbolic geometry by Beltrami, Cayley, and Klein. Thus inversive geometry includes the ideas originated by Lobachevsky and Bolyai in their plane geometry. Furthermore, Felix Klein was so overcome by this facility of mappings to identify geometrical phenomena that he delivered a manifesto, the Erlangen program, in 1872. Since then many mathematicians reserve the term geometry for a space together with a group of mappings of that space. The significant properties of figures in the geometry are those that are invariant under this group. For example, Smogorzhevsky develops several theorems of inversive geometry before beginning Lobachevskian geometry. The transformation by inversion in hyperplanes or hyperspheres in En can be used to generate dilations, translations, or rotations. Indeed, two concentric hyperspheres, used to produce successive inversions, result in a dilation or contraction on the hyperspheres' center. Such a mapping is called a similarity. When two parallel hyperplanes are used to produce successive reflections, the result is a translation. When two hyperplanes intersect in an (n–2)-flat, successive reflections produce a rotation where every point of the (n–2)-flat is a fixed point of each reflection and thus of the composition. All of these are conformal maps, and in fact, where the space has three or more dimensions, the mappings generated by inversion are the only conformal mappings. Liouville's theorem is a classical theorem of conformal geometry. The addition of a point at infinity to the space obviates the distinction between hyperplane and hypersphere; higher dimensional inversive geometry is frequently studied then in the presumed context of an n-sphere as the base space. The transformations of inversive geometry are often referred to as Möbius transformations. Inversive geometry has been applied to the study of colorings, or partitionings, of an n-sphere. Computing the Jacobian in the case zi = xi/||x||2, where ||x||2 = x12 + ... + xn2 gives JJT = kI, with k = 1/||x||4, and additionally det(J) is negative; hence the inversive map is anticonformal. In the complex plane, the most obvious circle inversion map (i.e., using the unit circle centered at the origin) is the complex conjugate of the complex inverse map taking z to 1/z. The complex analytic inverse map is conformal and its conjugate, circle inversion, is anticonformal. In this case a homography is conformal while an anti-homography is anticonformal. which are invariant under inversion, orthogonal to the unit sphere, and have centers outside of the sphere. These together with the subspace hyperplanes separating hemispheres are the hypersurfaces of the Poincaré disc model of hyperbolic geometry. Since inversion in the unit sphere leaves the spheres orthogonal to it invariant, the inversion maps the points inside the unit sphere to the outside and vice versa. This is therefore true in general of orthogonal spheres, and in particular inversion in one of the spheres orthogonal to the unit sphere maps the unit sphere to itself. 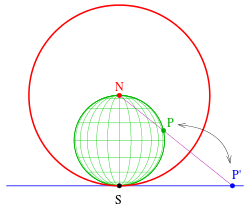 It also maps the interior of the unit sphere to itself, with points outside the orthogonal sphere mapping inside, and vice versa; this defines the reflections of the Poincaré disc model if we also include with them the reflections through the diameters separating hemispheres of the unit sphere. These reflections generate the group of isometries of the model, which tells us that the isometries are conformal. Hence, the angle between two curves in the model is the same as the angle between two curves in the hyperbolic space. ^ Kasner, E. (1900). "The Invariant Theory of the Inversion Group: Geometry Upon a Quadric Surface". Transactions of the American Mathematical Society. 1 (4): 430–498. doi:10.1090/S0002-9947-1900-1500550-1. JSTOR 1986367. Weisstein, Eric W. "Inversion". MathWorld.